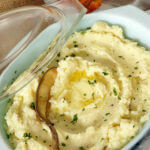 Cauliflower Mashed Potatoes - our favorite way to enjoy mashed potatoes! Cauliflower gives them an updated flavor with cheese & sour cream goodness....oh yes! Remove the core from the cauliflower and cut it into large florets. Peel and dice the potatoes. They are more dense than cauliflower, cutting them into a dice smaller in size than the cauliflower will ensure both cook evenly and be done at the same time. Combine cauliflower & potatoes in a large pot & cover with cold water - add a heaping tablespoon of salt. Bring water to a boil, reduce to simmer until the potatoes & cauliflower are fork tender, 12-15 minutes. Drain really well in a colander and return the potatoes and cauliflower to the hot pot that you cooked them in set on the stove (burner off). Setting them back on the stove, onto the hot burner will steam the remaining water off the vegetables. In a small pan, warm the sour cream and butter. Add it to the potatoes along with the shredded cheese. With a potato masher, potato ricer or a hand mixer, mash/mix until they are well combined. If the potatoes need some extra moisture, add the milk. Taste & adjust seasonings. Because the cheese is salty, you may not need any additional salt, but I always add a pinch of pepper.